When attempting to market your website, content plays an important role in your SEO marketing strategies. But there is a constant debate about the content size and whether you should opt for long or short form of content. It is indeed a challenge to bridge the difference and strike a perfect balance. Thankfully, there is a way out to solve this confusion by understanding what long content really implies and how it affects your marketing plan. 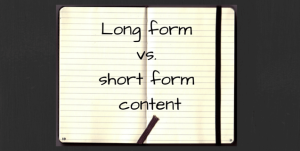 It is best to have a mix of both long and short form of content in your website. But before you attempt to balance both, care needs to be taken that you understand both these concepts and the advantages it caters. So let us know in detail about both these approaches. Blog posts those under 1000 words fall under the category of short form of content. In fact, social media content and infographics are also considered to be short content. In fact, short contents are a extremely effective when it comes to social media marketing. Short form contents have facts mentioned but they don’t focus on too much in-depth knowledge. Short contents are extremely useful because it help viewers get answers to their specific questions without having to read excessive information. The content is a lot more focused and specific to the thoughts of readers. In fact, this content is easy to share in social media as well that helps further in marketing your brand. It enhances the experience of readers because they can easily scan for the information they have been looking for. SEO marketers are of the opinion that long form contents have tremendous SEO benefits and how improved search rankings for your website. Readers benefit a lot in case of long form contents because they get detailed information that helps them increase their knowledge base. Going by statistics, a content with 1700 words are considered to be long form content. These contents are a great way to attract the attention of potential readers. 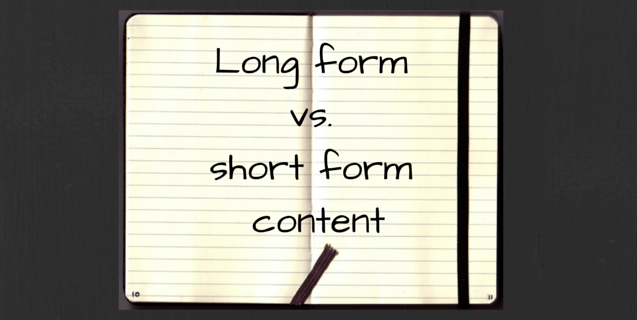 Long form contents are a great way to increase credibility and value of the website. Higher the word count, greater will be the ability to cross link the entire content with authority links. In fact cross linking is a great way to increase website traffic and improve the website visibility. You get to receive detail oriented researched content. The approach is storytelling and information based. So make sure you understand both these concepts very well and strike a perfect balance between them to get effective results.